I began five years ago looking intensely at the grocery store conundrum in Detroit. There were handfuls of academic writings and news articles about how national and chain grocers abandoned the inner city, in Detroit and other notable cities. This abandoning of the urban core is a phenomena is best understood in terms of chain supermarkets, but the practice and theory applies to many other retailers and business types too. It is also important to look at what kinds of businesses have stayed or expanded in the same space. Detroit completely lost its Downtown commercial retail businesses in the half century decline of the city. The commercial core never recovered and even Hudson’s largest department store was torn down. The process of building a series of suburban malls followed the new city planning trend and places like Northland Mall, Southland Mall, and Oakland Mall sprang up. Grocery retail has seen the only real return with Whole Foods building in Midtown and Meijer opening on 8 Mile. The only other national retail chain within the city limits is Home Depot. The retailers that have remained in Detroit (and expanded) are small-scale retailers: drug stores and dollar stores which can hardly be compared to big box, national brand retailers. Family Dollar has expanded to almost 50 locations across the city. Detroit has also experienced a migration of manufacturing jobs out of the city over the last half century. As global competition increased and labor costs decreased in southern States and then internationally, Detroit’s car building prowess almost completely disappeared. 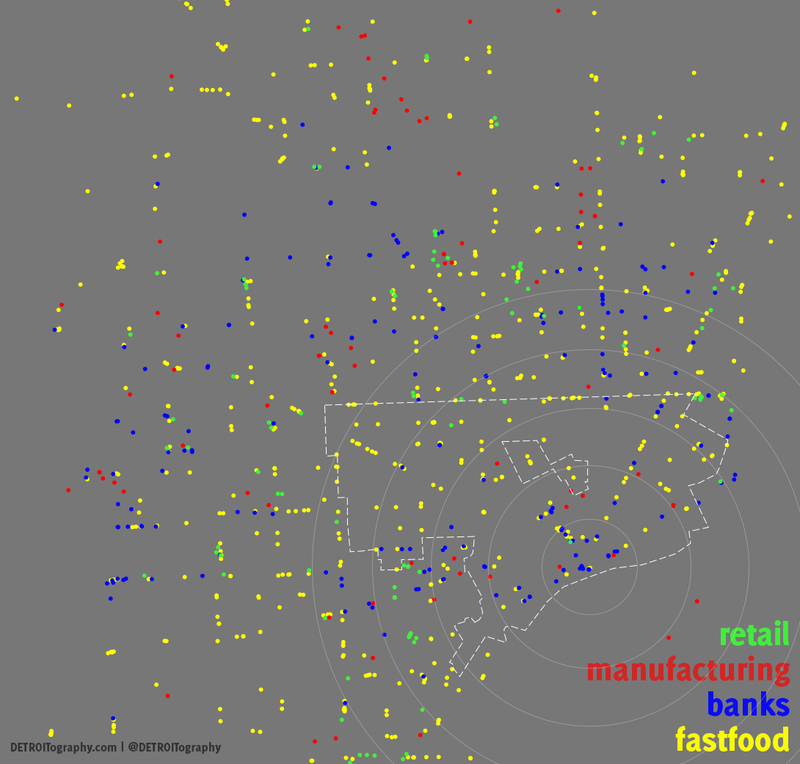 Currently there are a handful of random manufacturing industries scattered across the suburbs with only a few dotting the city landscape. The Crains Detroit list of major Michigan manufacturers was utilized. Chase Tower sits just Downtown (not to mention the subprime mortgage lending that decimated black home owners) and Fifth Third Bank recently announced that it will be moving its regional headquarters Downtown. Comerica Bank owns the naming rights to Tigers Stadium and what would a major city be without Bank of America, right? Besides drug stores and dollar stores, a main stay of national brands in Detroit has been the fast food industry. 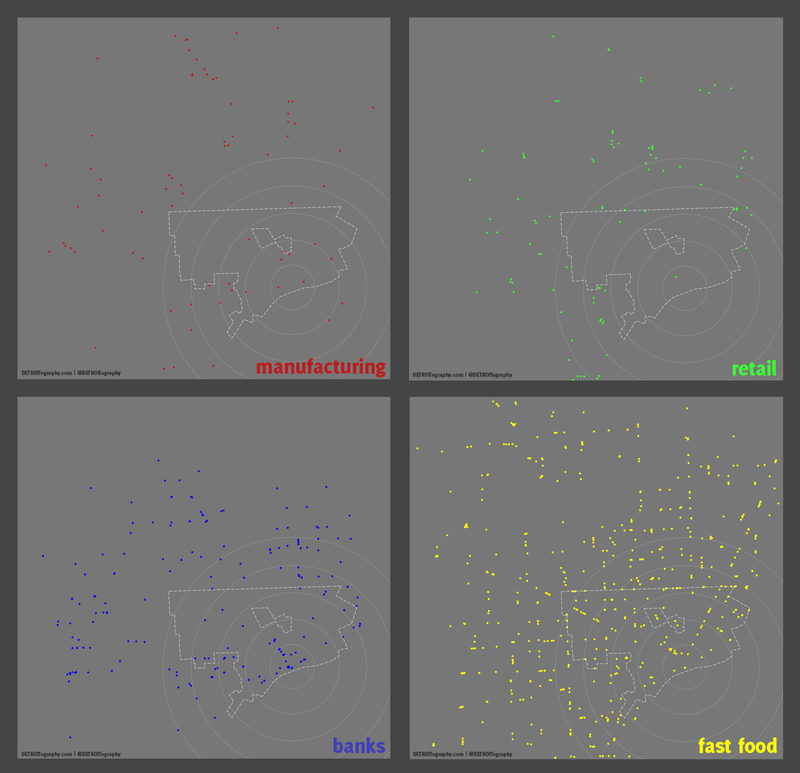 There are a number of local variations of fast food, including coney islands, but these maps just reflect the national brands from Fast Food Maps. This is looking mainly at national brands and does not account for the many local and independent businesses that have filled the void where national brands have discriminated. Alex, where did you get the data for these maps? Thanks and great work! Props. I’m excited that I found this blog.